Students often ask me if yoga is sufficient to develop overall fitness. Put more directly, if I practice yoga, can I cancel my gym membership? I always cringe a little before answering. As a yoga studio owner, the answer that would benefit me most is an enthusiastic, unqualified yes. Unfortunately, the true answer is probably not. Yoga is a valuable tool. It builds muscular strength, flexibility, and emotional wellness. It also develops an important component of fitness often overlooked in the West: respiratory fitness. That seems like a lot, and it is. All of the above are necessary. But they are not the complete fitness picture. Western forms of exercise provide an important and missing piece: cardiovascular–also known as aerobic–fitness, which is an essential component of heart health. The cardiovascular and respiratory systems are separate yet closely related. Asana and pranayama are excellent tools for impacting this–much better than Western aerobic exercises. Yoga tools, including asana and pranayama, are not as well suited for this type of fitness as Western aerobic exercises. Students often seem disappointed to learn this. After all, the ancient yogis used yoga (almost exclusively) to develop health and mental wellbeing. But those yogis lived in a different time, with completely different lifestyles. They lived very physical lives, practiced yoga, pranayama, and chant daily, and ate whole foods that were much less likely to cause heart disease than the overly-processed foods we consume now. The typical American yogi, on the other hand is likely to work eight or more hours at her desk job, park as close as possible to yoga class, then go home to binge on potato chips while watching someone else chant on American Idol. Heart disease is epidemic in our culture. Frankly, we’d be delusional to compare our lifestyles to those of yogis thousands of years ago. Nonetheless, I still ride an exercise bike three times a week, and I wouldn’t consider giving it up, in spite of my yoga practice. I’ve never claimed that yoga is a panacea able to cure all ills—but it can do a lot. Not just for the body, but also for the mind. I hope you’ll make it part of your wellness routine. Come visit Whole Life Yoga in Seattle! This entry was posted in Asana, Breath, Viniyoga on February 25, 2013 by Tracy Weber. I look forward to answering your questions in this blog. Please feel free to leave a comment or e-mail your questions to tracy@wholelifeyoga.com. A Whole Life Yoga student asks: Is there such a thing as too much yoga? I have spent most of the past few years doing yoga two to three times a week. Now, I’m at about seven. I feel like I’ve been more tired than I should be. This past week, I tweaked my shoulder. My overriding thought is that I’m doing too much yoga – that I increased the frequency too quickly rather than building up slowly. What are your thoughts? You’ve asked a great question, and I’m going to answer it with some generalities and even more questions. Appropriate yoga can be practiced every day safely. Inappropriate yoga done once a week or even once a month can be unsafe. Only you can figure out the answer for your situation. Here are some things to consider. Is your practice serving your body or injuring it? The goal in yoga should never be to achieve a certain pose or increase the level of physical challenge. The goal should be to meet your body where it is–in that moment–and to use yoga to bring your body, mind, and heart into a place of greater balance. If you find yourself competing, even with yourself, re-evaluate. Consider interspersing stronger yoga days at the studio with gentler home practices focused on mindfulness and breath. Also consider taking your practice back a notch or shortening the length of your home practices. How does your yoga practice balance the rest of your life? Since I know you, I can honestly say that you have a tendency to take on a lot. Are you getting enough sleep? Are you eating in a way that fuels your body? Are you taking time to do practices that fill your energy well? The exhaustion you feel may have little to do with your yoga practice, and a lot to do with imbalance in your everyday life. Take a good look at your practice. It should balance the stressors in your life, not add to them. If the rest of your life is “strong” make your practice gentle, and vice versa. Dr. David Frawley has a book, Yoga for Your Type, that shows how to use yoga to balance your Ayurvedic doshas. It might be a good place to start. Is your yoga practice an anchor or an addiction? When I was in my twenties, I had an exercise addiction. The need to exercise strongly, every day, was all-consuming. I planned vacations around it, chose not to socialize with friends because of it, and felt great anxiety when I couldn’t do it. The same can be true for your asana practice. Stop practicing for a few days and see how you feel. It’s perfectly fine to miss your practice, but you shouldn’t feel significant guilt or anxiety. Remember, your practice should serve your life, not replace it. If your practice is becoming an addiction, then pull off the Band-aid and stop practicing. In several weeks, start again, but not daily. Find a way to let your practice serve, rather than enslave you. I suspect that once you reflect on those questions, you’ll have your answer. If not, e-mail me again with what you’ve learned, and I can be of more help. Come visit Whole Life Yoga in Seattle, and check out Tracy Weber’s author page for information about the Downward Dog Mysteries series. A KILLER RETREAT is available for preorder now from Whole Life Yoga. MURDER STRIKES A POSE is available at Amazon, Barnes and Noble, and book sellers everywhere! This entry was posted in Asana, Student Questions, Yoga Books and tagged exercise addiction on February 18, 2013 by Tracy Weber. Those of you who are connected to me via Facebook may have noticed an increase in my postings there lately. To be honest, I’m hooked. I waste—or rather, invest—a couple of hours on it each day. My activities are varied: from oohing and aahing over cute puppy pictures, to sharing my adventures in trying to get published, to asking complete strangers if it’s silly to cry over Superbowl Clydesdale commercials. But one story really caught my attention. A week ago last Saturday Tasha, a friend, and I were walking on Greenwood Avenue, when a complete stranger stopped us and handed us a flyer. “Have you seen this dog?” she asked. We told her we hadn’t. She then said, “Keep your eyes open. She even has her own Facebook page.” I put the flyer in my pocket and looked, but I didn’t find the dog. The retriever mix’s sad eyes still haunted me the next day, so I visited her Facebook page, hoping to learn she’d been recovered. I was far from the only person who visited “Joy lost in Ballard.” Literally hundreds of people followed the discussion and offered to help. I shared the page on the studio’s and my personal pages and forwarded information on when I could. The odds of a happy ending weren’t good. 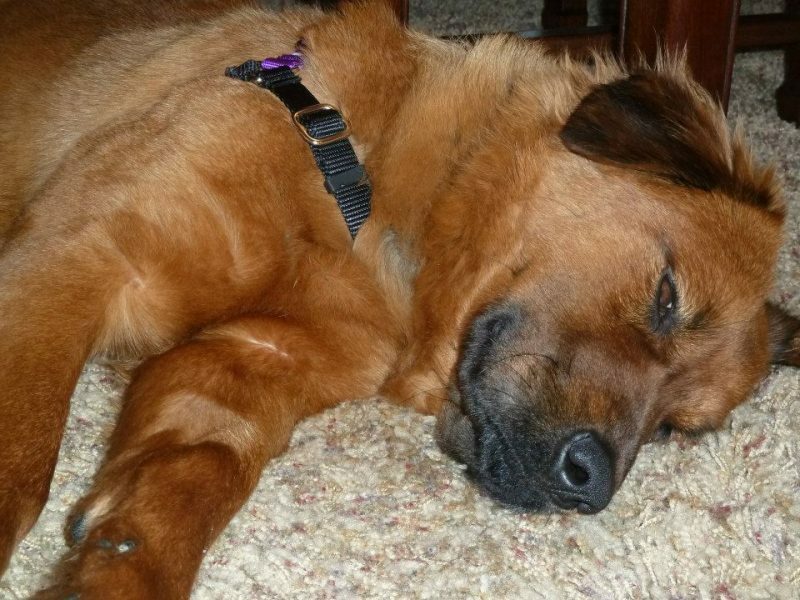 Joy had moved to Seattle from an out-of-state shelter just three days before she disappeared. She was easily frightened, and she hadn’t fully bonded with her new forever home. Worse yet, she slipped her collar, so she had no tags, and she didn’t yet know her name. Joy was more likely to run from someone trying to help than come to them. I continued following the story. My husband warned me that I was l annoying my Facebook friends by continuing to post updates. Yet shortly after he chided me, I caught even him checking for Joy sightings and considering joining the search. Like me, he was hooked. I don’t know if anyone involved in Joy’s story has ever done yoga, but they are all yogis. Complete strangers volunteered to get up at 3 AM to check humane traps, kept waders and dog treats in their cars “just in case,” discussed dog capture strategies, and created Joy sighting maps. These kind strangers were living examples of two yoga principles: sangha (community) and active compassion. The Yoga Sutras say that when yogis encounter suffering, they should respond with active compassion. In other words, yogis shouldn’t waste time feeling bad, we should help. The teachings also promise that in community, we find energy and healing we can’t find alone. That group of electronically-connected strangers demonstrated both of those concepts perfectly. They restored my faith in humanity. Ten days after she bolted, Joy was reunited with her family. She’s healthy and happy to be back home. We may never know what transpired during her adventure, but her travels touched the hearts of all those who helped her. And the people who helped her definitely made a mark on mine. Thanks to all of you who helped Joy and sent her positive energy. May you continue to find your own Joy in Seattle. This entry was posted in dogs, writing, Yoga Philosophy and tagged compassion, facebook, sangha on February 11, 2013 by Tracy Weber. Ahimsa—non-violence—is one of the most important concepts in yoga. In fact, the Yoga Sutras say it’s not just important; they say that ahimsa trumps all. In other words, when in doubt about what to do in any situation, act with ahimsa above all else. But ahimsa’s not as simple as choosing not to slug your neighbor when he annoys you. Ahimsa means non-harming at all levels: actions, communications, intentions—even thoughts. I don’t always succeed, but I’ve tried to live this way since long before I took my first yoga class. One memorable incident happened around third or fourth grade. I tearfully convinced my grade school science teacher to cancel the planned grasshopper dissection so I could release the small, winged creatures back out into the field. I’m pretty sure the grasshoppers were happier about my success than the school groundskeeper. Fast forward 30 years and enter one willful, stubborn, and impossible-to-potty-train puppy. I fell in love with Tasha the moment I saw her, even though she was only three weeks old. I gushed as I told the breeder all of my plans for the “soon-to-be-mine” puppy. Holistic vets, positive dog trainers—I even asked if Tasha could be vegetarian. The breeder’s expression changed from interest, to concern, to outright disbelief. When I finished, she said, “I can’t sell a puppy to you. You’re too nice to own a German shepherd. This dog will walk all over you, and you’ll return her to me, ruined.” I begged her to reconsider. She did, but only after handing me a list of requirements: specific training books, Western vets, and high-meat dog foods. Then she sent me home and told me to come back when I could prove my worthiness. Five weeks later, I returned, carrying a dog crate and looking my toughest. I threw around terms like prong collars, leash pops, and human pack leaders. Convinced she’d converted me, she sold me my dog. Unfortunately, Tasha never read those training books. She was smart as a whip, but had no concept of bladder control. I followed all the rules in the books. I tethered her to me; I took her out every hour; I carefully watched for the circling and sniffing they promised would happen. Tasha was a trickster. Her favorite trick was to wait until I went to the bathroom. Then she’d immediately squat just out of reach and do the same. I’m not sure who spilled more urine on our bathroom floor—her as she squatted, or me as I tried to grab her. I e-mailed the breeder and followed her advice. I threw toilet paper rolls at my puppy; I rattled coins in jars; I sternly scolded her each time she was “naughty.” My tactics weren’t quite up there with shock collars, but they weren’t exactly ahimsa-like, either. The only thing that changed was Tasha. She had the same number of in-house accidents, but now she cringed, waiting to be punished, after each one. This lasted a week; then I came to my senses. I tossed out the training books, stopped calling the breeder, and followed instead what I knew in my heart. Instead of punishing Tasha when she did wrong, I gushed with enthusiasm when she did right. The change was immediate. My puppy changed overnight from frightened and cringing to boisterous and happy. Perfecting her potty training took much longer, but I could live with that. Over the years we’ve dealt with issues much more serious than soiled carpeting. But my training approach has stayed true. I treat Tasha with praise, love, and a complete lack of violence, in actions, words and vocal tone. Tasha grew into a wonderful dog, but she wasn’t the only one changed. People noticed the shift in me, too. Since I’ve lived with my dog, people tell me I’m kinder; my interactions with others, more patient. Tasha taught me more about ahimsa than the sutras ever could. Vets and trainers tell me that Tasha’s trust in me is impressive. Strangers walk by us, yelling at their own dogs while jerking their leashes. Then they stop and tell me they wish their dog was as well-behaved as mine. People even yell from the distance, “You two are so good together!” And they’re right. But only because I followed the yoga teachings instead of a well-meaning dog breeder. My challenge to each of you is to examine your interactions with others—both human and animal. Notice your actions, communications, and thoughts. Try to act with more compassion—more ahimsa. You may not change the behaviors of those around you, but you will definitely change yourself. And for those of you interested, I did end up working with a great Seattle dog trainer, who shares this philosophy. They even use the word ahimsa in their business name! Ahimsa Dog Training. Here’s their link on ahmisa. This entry was posted in dogs, Yoga Philosophy and tagged ahimsa, dog training, dogs on February 4, 2013 by Tracy Weber.